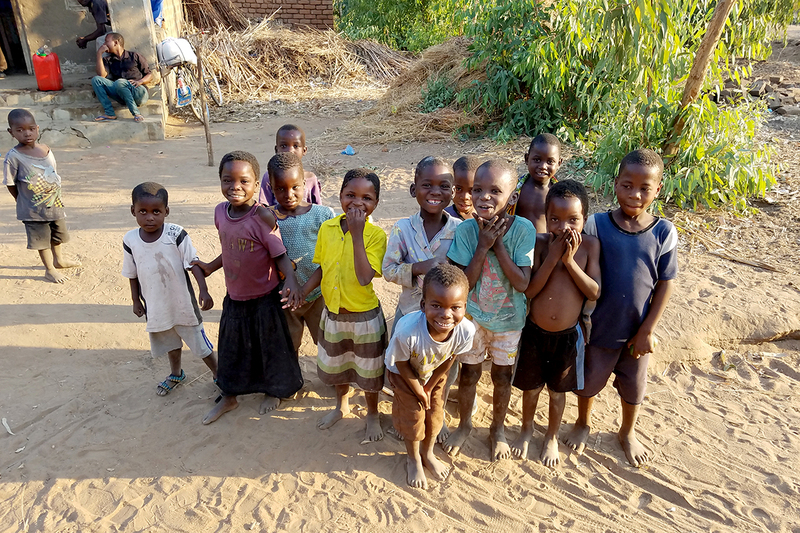 Everywhere we went in Zomba District, we attracted large crowds of curious kids. Most of them had never seen an American before. But really, I think they were attracted by our fun-loving female graduate student, Tryness Banda, who joked with and teased them. Here was an educated young Malawian woman working closely with an American expert. I could see the wonder in the eyes of the little girls. I was glad that the team provided something so tangible for their aspirations. JIMU VILLAGE, ZOMBA DISTRICT, MALAWI – It is just past noon as Zuze Dulanya, Evance Mwathunga and I climb out of the van. 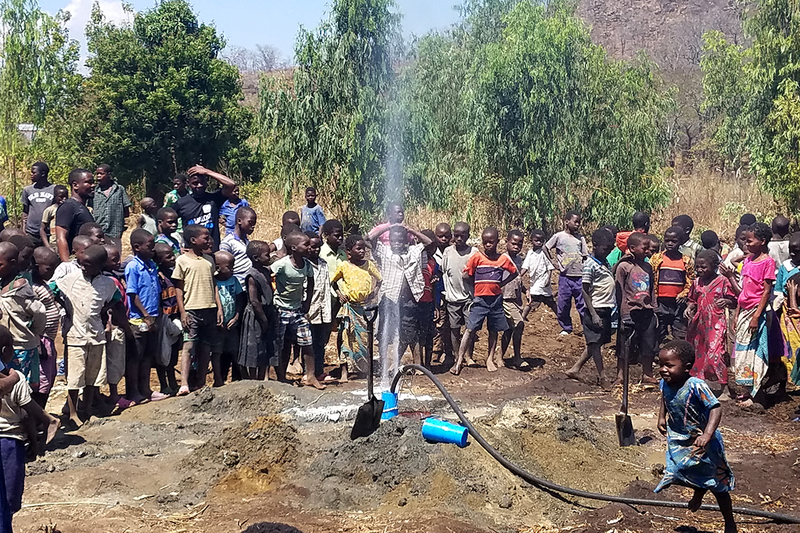 The shiny new handpump for Jimu Village sits where just last week a drill rig bored the hole for this much needed, much anticipated new water source. Beneath a nearby row of sweet gum trees, two long benches surround a lone, red-cushioned side chair. 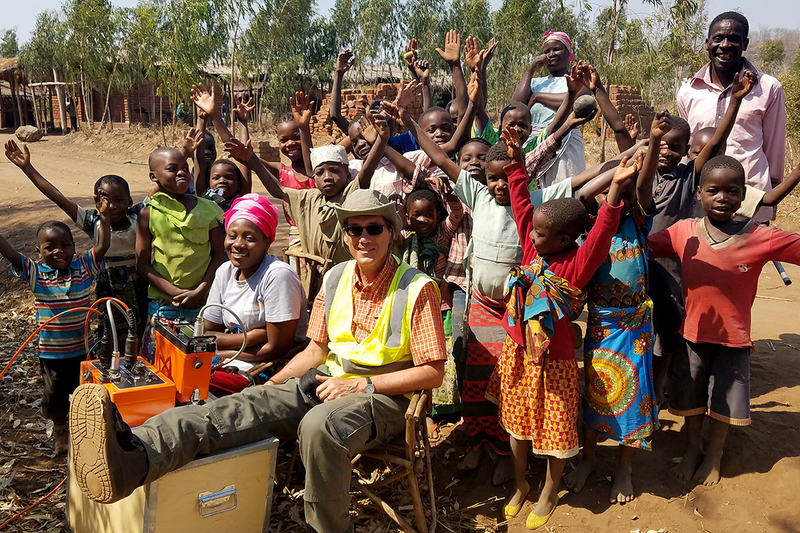 University of Malawi graduate student Tryness Banda and I laugh and joke with village children as we collect geophysical data in Jimu Village. We will use this data to help pick a location for a new borehole for the village. 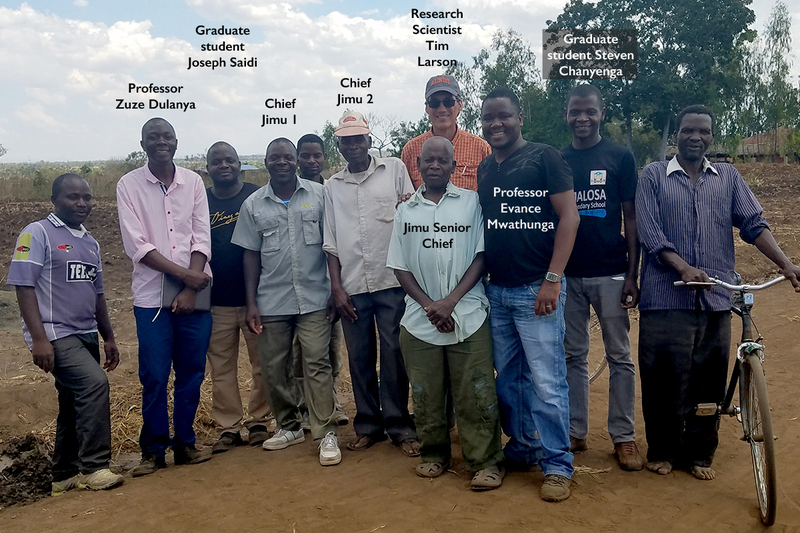 This Geoscientists Without Borders project was designed to build the geoscience capacity of the local university, train local graduate students and provide tangible humanitarian benefit. Sure enough. The crowd of villagers gathers. Dignitaries take their seats on the bench. I am ushered to the side chair. There are speeches of appreciation. Zuze whispers translations in my ear. I nod and smile. 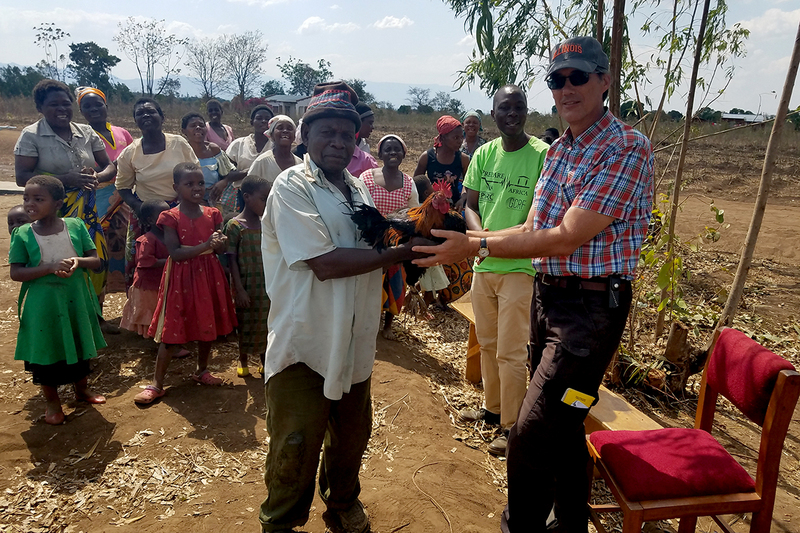 Members of the Geoscientists Without Borders team pose with Jimu villagers after the successful completion of a new village borehole. Evance begins to ramble in his “Speech of Response” and my mind turns to the whirl of activity that led to this moment. 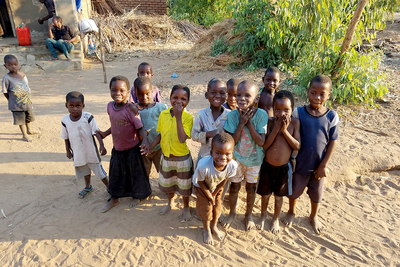 Many of these happy faces wore skeptical frowns last April when we first approached the villagers with our crazy idea to find a new water source for them using high-tech instruments. 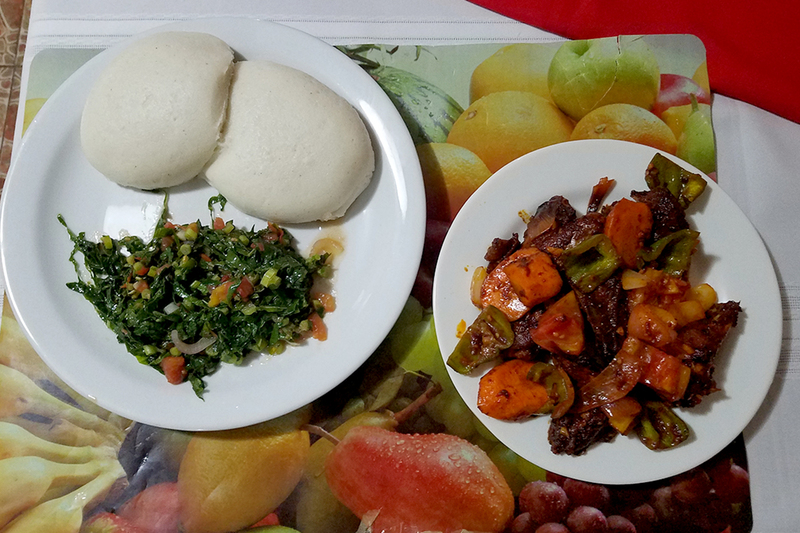 Zuze, a professor of geology; Evance, a professor of geography at the University of Malawi; three graduate students and I had to convince them to let us try. Even last week, I am sure, some were ready to scoff when the drillers passed 20 meters and saw no sign of water. But there was moisture at 25 meters and soil saturation at 29. We continued to drill to 40 meters, just to be sure. Now, everyone is smiles and grins. At the very end of the drilling process, the drillers use an air compressor to force out the water, mud and sand at the bottom of the borehole. Evance, always the diplomat, ends his speech by asking the women to say how this borehole might benefit them. Shyly, they stand and speak. “My husband complains that I am gone too long to fetch water; he will be happy now,” another woman says. Several others offer similar understated responses. 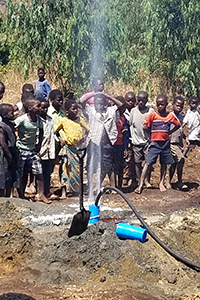 A population explosion in rural Malawi means it’s commonplace for women and children to wait in long queues to draw water. With that, the presentation draws to a close. 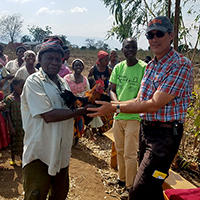 At the close of the ceremony opening the new borehole at Jimu Village, the chief presents me with the traditional thanksgiving gift: a live chicken. In the villages, chickens are only slaughtered for special occasions, so I realize that this is a momentous event. “Zuze, the chief has a chicken under his arm!” I whisper. “Yes, and we know who will be getting that, too,” he says. What does one do with a gift chicken? It is certainly not meant to be a trophy, but to be dinner. Clearly, this is a big deal. I try to convey my gratitude without choking up. Zuze takes the chicken for me. The bird squawks and squirms. She will make a worthy barbeque later tonight. But now, our attention turns to the new borehole. The area mechanic responsible for maintaining boreholes in the surrounding villages solemnly attaches the handle to the pump and everyone takes turns trying it out. Water gushes from the spout. Women break into joyous ululation. There is dancing and singing. Jugs and pails are filled to the brim. Seizing the moment, Evance gathers the mechanic and the chief to talk about forming a new water committee to oversee the operation of the borehole. Local management will be crucial to the long-term viability of this new resource. 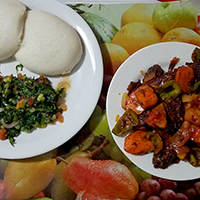 The burdens of living have been eased just a little in this out-of-the-way country village. I am honored to be a part of that. Geoscientists Without Borders funded this project.